It's lent and for many Catholics, it's their time of fasting and going on a meatless diet especially on Good Friday. Yesterday, I went out for my regular me-time session but this time, I skipped the spa. Instead, spent the afternoon just having coffee at Figaro while reading another Christian books by Nelson Dy. Me-time is something I do for the past four years now. I find it very helpful in dealing with all sorts of stresses in life. Writing down my worries and what I'm grateful for. Because it's lenten season, I made efforts to catch up my readings of Christian books and listen to worship songs on Spotify, playing all day when I'm at home. Every time I'm at Figaro, I would order the all-day breakfast meal. This time, I chose Pasta Altonno, cooked in olive oil and tuna with slices of green and black olives, herbs and served with sliced toasted baguette. The flavor is very satisfying, light but filling. It's been days now, I'm thinking about ways on natural eye healing. I'm seriously taking a research about the Bate's Method. Have you heard about it? Well, it's not me who's suffering with eye problem, although I'm also nearsighted so I'm thinking of applying the Bate's method for myself and see if it really works. How about you? Have you tried Bate's Method? I'm also looking for the book "Releasing to See" by Thomas Quackenbush. Any suggestion would be gladly appreciated. I still remember what Dr. Jo of the Rapha Valley farm in Negros told us "your food is your medicine, so take it fresh." The colorful the plate is, the better, the healthier. Aside from Pasta Altonno, I had Figaro's Greek Salad. It has feta cheese, crunchy lettuce, cucumber, peppers, and tomatoes. They also have other kinds of salad like Caesar's salad and tuna macaroni salad. 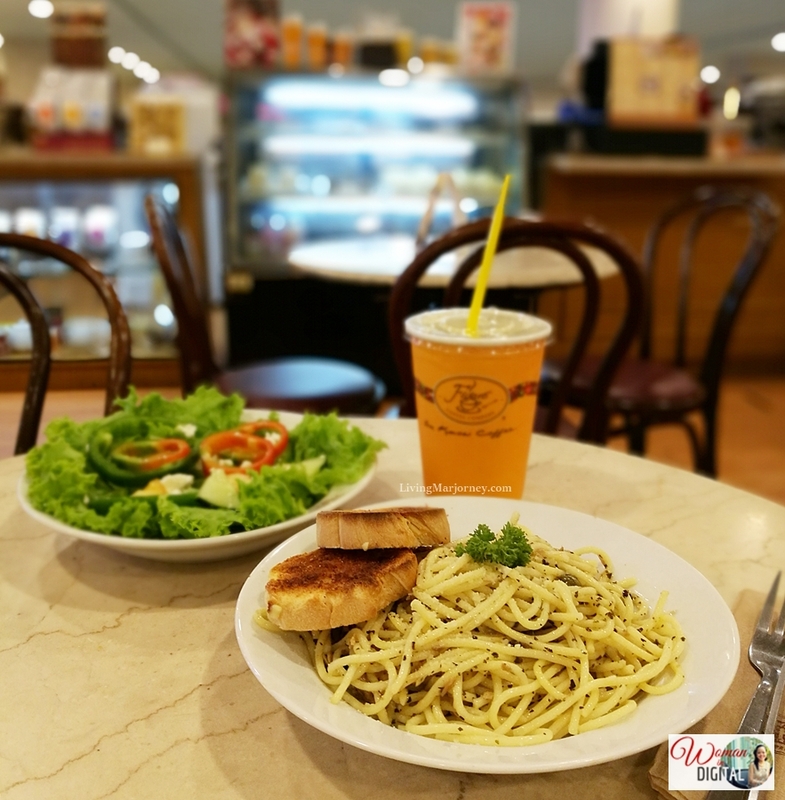 For a complete list of food offerings, you may find it at Figaro Coffee website. 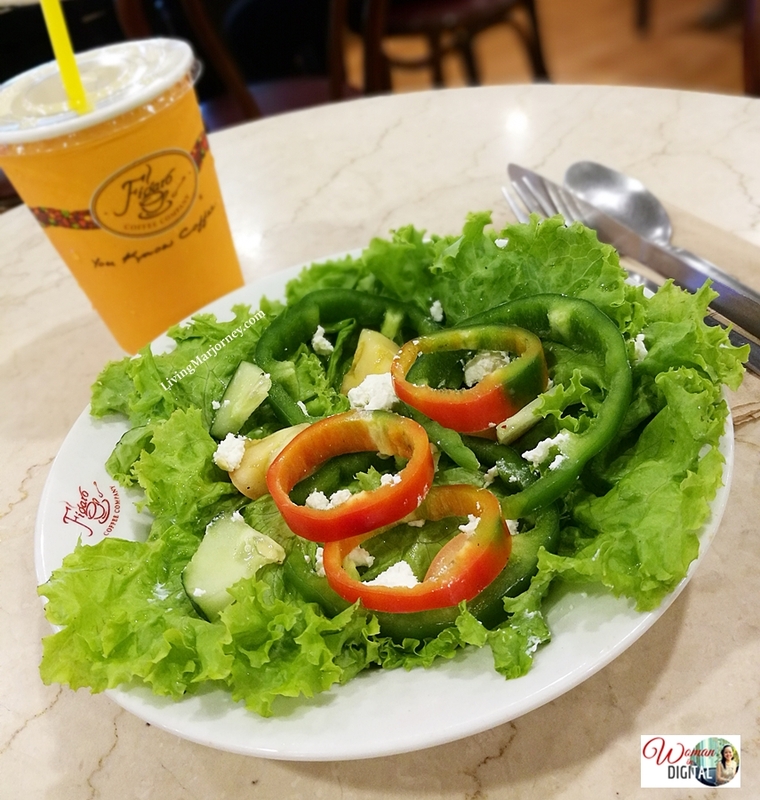 One of the reasons why I like dining at Figaro Coffee is because they have a wide variety of choices, not only sweet pastries and cakes also healthy and rice meals. Speaking of meatless diet, since lent has started many of us are looking for restaurants offering lenten meals like vegetables, fish and seafood dishes. Here at Figaro, you'll definitely find a dish or two to accompany you during this season.